Aura Cacia®, America’s leading essential oil brand, is introducing a new line of Essential Solutions™ mists. The five new mists can be used for both room and body. Packaged conveniently in a two-ounce aluminum bottle with mist dispenser for ease of use, each unique essential oil blend offers solutions for everyday situations. We’re excited to introduce this unique line of essential oil mists. The fun product names and small packaging make it easy for anyone to experience true aromatherapeutic benefits of pure essential oils, whenever they need it most. Now, instead of reaching for that cup of jolt or the pill to help you experience restful, dreamy slumber, we all have a more natural way of achieving a preferred state of mind and spirit. Aura Cacia®, America’s leading essential oil brand, is introducing a new line of Essential Solutions™ mists. The five new mists can be used for both room and body. Packaged conveniently in a two-ounce aluminum bottle with mist dispenser for ease of use, each unique essential oil blend offers solutions for everyday situations. 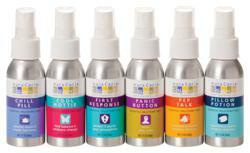 “We’re excited to introduce this unique line of essential oil mists. The fun product names and small packaging make it easy for anyone to experience true aromatherapeutic benefits of pure essential oils whenever they need it most,” says Jane Merten, Aura Cacia’s Senior Brand Manager. The five new Essential Solutions mists complement the best-selling Pillow Potion mist. The mists can be purchased directly from Aura Cacia or through retailers nationwide. Each mist has a suggested retail price of $7.99. Founded in 1982 and based in Urbana, Iowa, Aura Cacia provides people with natural and organic personal-care products made with 100% pure essential oils. Aura Cacia fulfills 'the desires for comfort, health and safety in personal care products by combining the benefits of essential oils with practical products that can be used every day by the whole family. Aura Cacia is a registered brand of Frontier Natural Products Co-op™, based in Norway, Iowa. Founded in 1976, Frontier Natural Products Co-op offers a full line of natural and organic products, including culinary herbs, spices and baking flavors; bulk herbs and spices; and natural and organic essential oil products. Frontier's goal is to provide consumers with the highest-quality organic and natural products while supporting and promoting social and environmental responsibility. To learn more, visit http://www.auracacia.com and http://www.frontiercoop.com.